An Overview of Applying For Membership. 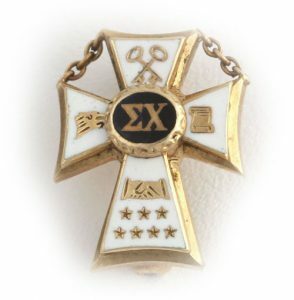 Sigma Chi Badge – Earned by all active brothers. Sigma Chi is a men’s organization that allows membership based on a process implemented at the undergraduate chapter level called “bidding.” The process on each campus and within each chapter varies, but at its heart is an evaluation of potential candidates whereby existing members measure candidates against the Fraternity’s minimum set of standards for membership, known as The Jordan Standard. If a chapter’s membership determines that the potential candidate is a good fit for Sigma Chi, the candidate should decide if Sigma Chi is a good fit for him. The commitment to being a Sigma Chi is a lifelong obligation and is not one to be taken lightly. Therefore, potential members should feel encouraged and welcome to ask any questions they may have before making the decision to join. After the chapter offers a bid to a prospective member and the individual accepts it, the process of pledging begins. “Pledging” quite literally means that the individual is making a promise to live up to the standards of Sigma Chi, and constitutes a trial period for the potential member to try Sigma Chi out before making the full committment required of lifelong membership. Upon the completion of the pledging process, the potential member is initiated into Sigma Chi by partaking in the Fraternity’s Ritual. The health of an organization is determined by the quality of its members. Knowing this, it is helpful to keep in mind that there are two facets of requirements for becoming a Sigma Chi. Firstly, a potential member must possess the qualities and convictions set forth in the The Jordan Standard, which ensures that men who are invited to pledge are worthy of membership. Secondly, potential members must meet the specifications laid out in the Fraternity’s Governing Laws. Click here to view The Jordan Standard. Sigma Chi, like many organizations, employs a probationary period for its prospective members before their initiation into full membership. This period, called pledgeship, serves to educate a potential brother about the Fraternity before he decides to join. During pledgeship, men develop and enhance their interpersonal skills through involvement in all aspects of chapter life. They interact with other pledges, undergraduate and alumni members, and develop as leaders in the community. Sigma Chi enforces a zero-tolerance policy for hazing and cultivates an atmosphere that supports personal growth and leadership development. To read more about the pledge program, click here.